Julie Murphy and her lemonade stand. Source of photo: online version of the NYT article quoted and cited below. (p. A8) When life gives you lemons, make lemonade. When health inspectors cite you for it, get famous. 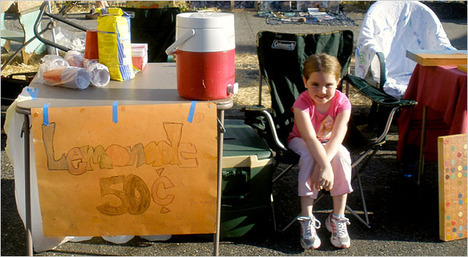 Julie Murphy, a 7-year-old Oregonian, set up a lemonade stand on July 29 at an art fair in northeast Portland. County health inspectors shut her down, however, telling Julie and her mother, Maria Fife, that they needed a temporary restaurant license, which costs $120. The penalty for selling food without a permit, they warned, was $500. At 50 cents a cup, that’s a lot of lemonade. Others at the fair urged the family to give away the lemonade, and they wrote “free” and “suggested donation” on Julie’s sign with a marker. But the inspectors were unmoved. Julie left the fair in tears. 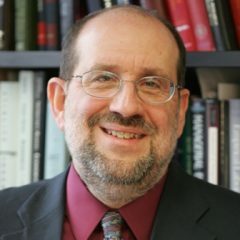 JOHN SCHWARTZ. “Sorry, Kid: No License, No Lemonade.” The New York Times (Sat., August 7, 2010): A8.